South Korean President Moon Jae-in said today that North Korean leader Kim Jong Un soon will visit Seoul. "A return visit to Seoul by Chairman Kim Jong Un will also take place soon," Moon said in front of the National Assembly. 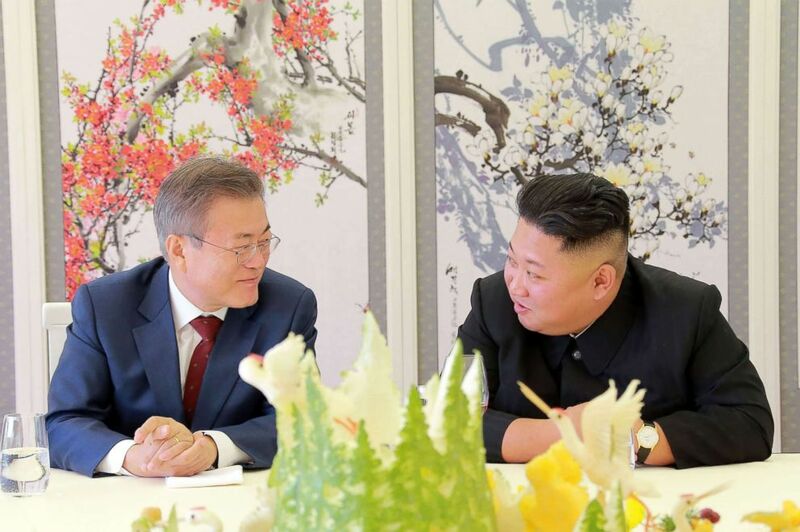 The comment, included during a speech on the government's next proposed budget, came as Moon also elaborated on the prospects for continuing to improve relations between the two nations, including denuclearizing the peninsula. North Korea's leader Kim Jong Un talks to South Korean President Moon Jae-in during a visit to Samjiyon guesthouse near Mount Paektu in Samjiyon in this picture taken Sept. 20, 2018, and released by Korean Central News Agency (KCNA) via KNS. "Now, based on firm trust among one another, South and North Korea and the United States will achieve complete denuclearization and lasting peace," Moon said. "This is an opportunity that has come like a miracle. It's something that we should never miss." Moon also underlined the fact that military threats between the two Koreas no longer exist. The new inter-Korean military agreement signed by the head of each nation's defense department took effect today. Leaders of the two Koreas announced during the third inter-Korean summit in Pyongyang in September that Kim will make a return visit to Seoul within this year, unless there are extenuating circumstances. "Kim Jong Un's visit to Seoul must imply a progress in North Korea's denuclearization willingness," Cheol-wun Jang, a professor at the Seoul-based Institute for Far Eastern Studies at Kyungnam University, told ABC News. "It would also mean that North Korea has cleared their position regarding North Korea-U.S. relations, ready to engage in outside activities." Kim would become the first leader of North Korea ever to visit South Korea's capital.